French watch manufacture Pequignet is launching its new “Manufacture Diver” collection and presents the “Royale 300”, the perfect balance between innovation and modernity. The latest generation of the famous movement from the manufacture, the Calibre Royal, is integrated in a model which meets the highest requirements of a professional diving watch. The unidirectional rotating bezel covered in rubber and with a capsule at 12 o’clock has a 60-minute scale for divers to calculate their decompression phase precisely. The patented, quarter-turn crown indexed with the Fleur-de-Lys is ideal for quick and easy handling. Its multi-level dial has a small second at 3 o’clock and an 88-hour power reserve between 7 and 8 o’clock. Its sporty design with indices and hands coated with Luminova BGW9 provide optimal legibility, essential underwater and at sea. This new diving watch is water-resistant to 300 metres. 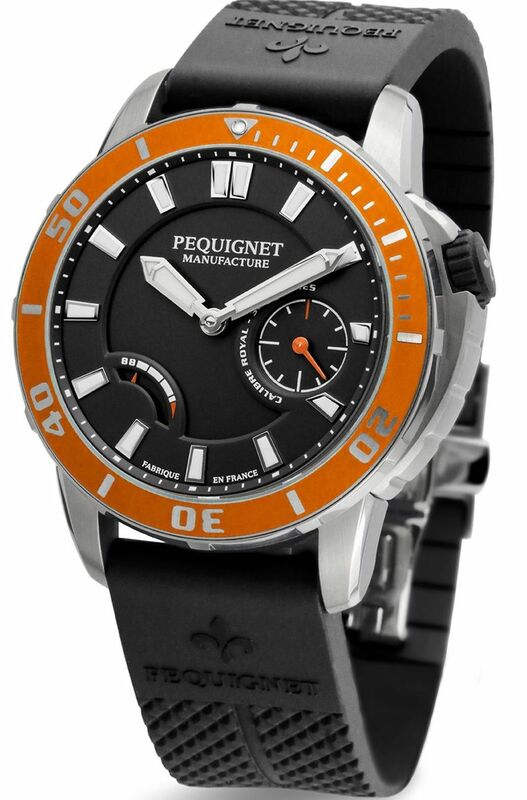 Its polished satin-finish steel case is available in 3 models with an orange, black or blue bezel. The watch is worn with a mono-block rubber strap with a double-closure butterfly buckle decorated with the Fleur-de-Lys logo and available in three colours (orange, black or blue) to match the bezel. Waterproof to 30 bar (300 metres).